COMMENTS: normal series from 1983 to 2001. Front plate. 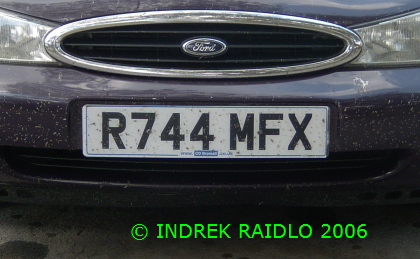 Black on white reflective front plate mandatory for vehicles manufactured since 1973. Mandatory lettering style since 2001. FX=Bournemouth. R indicating that registration was made between 01.08.1997 and 31.07.1998. COMMENTS: normal series from 1983 to 2001. Rear plate. Black on yellow reflective rear plate mandatory for vehicles manufactured since 1973. Mandatory lettering style since 2001. LB= London, north-west. 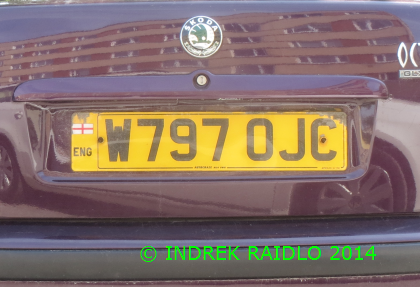 W indicating that registration was made between 01.03.2000 and 31.08.2000. COMMENTS: normal series from 1983 to 2001. 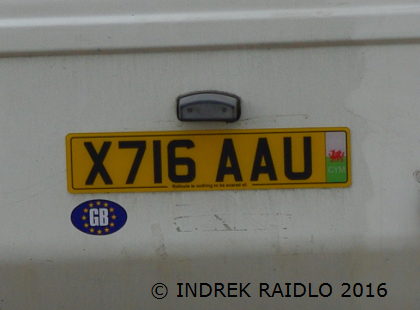 Rear plate. Black on yellow reflective rear plate mandatory for vehicles manufactured since 1973. Mandatory lettering style since 2001. National band to the left officially available since 2009. SC=Edinburgh. M indicating that registration was made between 01.08.1994 and 31.07.1995. COMMENTS: normal series from 1983 to 2001. Front plate. Black on white reflective front plate mandatory for vehicles manufactured since 1973. Mandatory lettering style since 2001. National band to the left officially available since 2009. WN=Swansea. J indicating that registration was made between 01.08.1991 and 31.07.1992. COMMENTS: normal series from 1983 to 2001. Front plate. 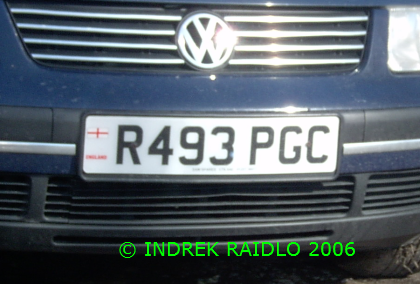 Black on white reflective front plate mandatory for vehicles manufactured since 1973. National band to the left officially available since 2009. GC = London , south-west. R indicating that registration was made between 01.08.1997 and 31.07.1998. COMMENTS: normal series from 1983 to 2001. Rear plate. Black on yellow reflective rear plate mandatory for vehicles manufactured since 1973. Mandatory lettering style since 2001. JC= Bangor. 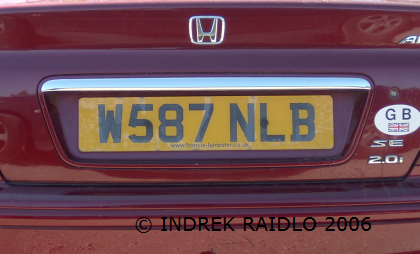 W indicating that registration was made between 01.03.2000 and 31.08.2000. COMMENTS: normal series from 1983 to 2001. 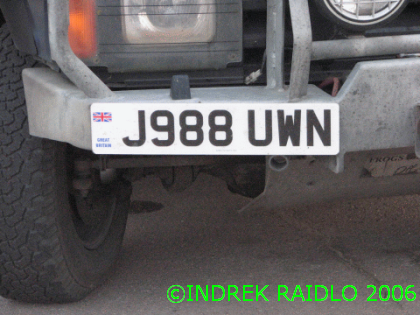 Rear plate. Black on yellow reflective rear plate mandatory for vehicles manufactured since 1973. Mandatory lettering style since 2001. AU= Nottingham. X indicating that registration was made between 01.09.2000 and 28.02.2001. COMMENTS: normal series from 1983 to 2001. 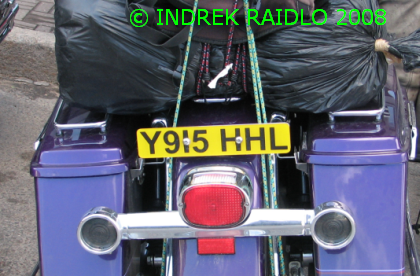 Rear plate only (motorcycle). Black on yellow reflective rear plate mandatory for vehicles manufactured since 1973. HL= Sheffield. 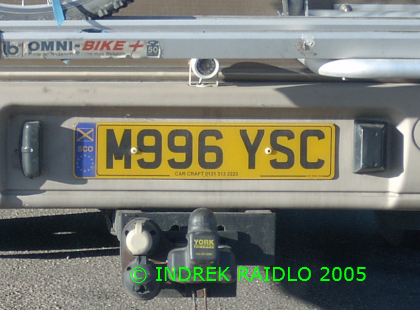 Y indicating that registration was made between 01.03.2001 and 31.08.2001. COMMENTS: normal series from 1965 to 1983. 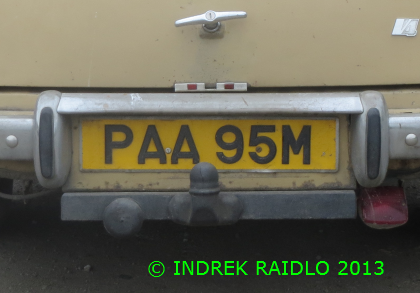 Rear plate. Black on yellow reflective rear plate mandatory for vehicles manufactured since 1973. TT= Devon. M indicating that registration was made between 01.08.1973 and 31.07.1974. COMMENTS: normal series from 1965 to 1983. Rear plate. 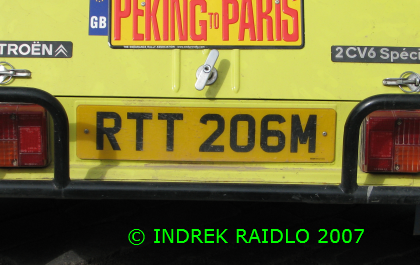 Black on yellow reflective rear plate mandatory for vehicles manufactured since 1973. AA = Hampshire. M indicating that registration was made between 01.08.1973 and 31.07.1974.